The Canadian Senate expenses scandal is an ongoing political scandal concerning the expense claims of certain Canadian senators which began in late 2012. Senators Patrick Brazeau, Mike Duffy, Mac Harb, and Pamela Wallin claimed travel and living allowance expenses from the Senate for which they were not eligible. Deloitte LLP was retained to provide the Senate with an independent examination of the expense claims. Duffy, Harb, and Wallin repaid ineligible amounts. Harb retired a few months into the scandal, and in November 2013, Brazeau, Duffy, and Wallin were suspended from the Senate without pay. Brazeau, Duffy, and Harb were criminally charged. On April 21, 2016 Duffy was acquitted on all charges. Charges against Harb were withdrawn and no charges were to be laid against Wallin. The scandal attracted much public attention, with as many as 73% of Canadians following it closely. As a result, the Auditor General of Canada examined expense claims made by all the other 116 senators and former senators over a two-year period. In a June 2015 report, the Auditor General identified thirty senators whose claims were inappropriate, and of these, recommended that nine cases be referred for police investigation. Fourteen of these senators opted for binding arbitration by former Supreme Court of Canada Justice Ian Binnie, and his report was issued on March 21, 2016. The investigation of senator expenses began in November 2012 with the living expense claims of Patrick Brazeau  and the travel expense claims of Pamela Wallin. By December 6, 2012, the Senate investigation was expanded to include the living expenses of Mac Harb On January 3, 2013, the Senate formally retained Deloitte LLP to review the claims of Brazeau, Harb and Wallin. In February 2013, the Deloitte retainer was expanded to include Mike Duffy's living expense claims. In March 2013, and before the Deloitte audit was complete, Duffy repaid $90,172 for the living expenses he had claimed. :5  It was later learned in May 2013 through the media that the source of this money was a personal cheque provided by Nigel Wright, who was then Chief of Staff in the Prime Minister's Office. It emerged that the Conservative-dominated Senate committee had drafted the May 9 report on Duffy's living expenses to reflect less poorly on Duffy, who was at that time a member of the Conservative caucus. After two weeks of controversy, and amid concerns that Duffy was claiming travel expenses from both the Senate and the Conservative Party, the Senate reopened Duffy's audit. On May 29, 2013 the Senate issued a report amending the May 9 one, and recommending that Duffy's case be referred to "the proper authorities." In the months following, many of Canada's political parties reiterated their positions that the Senate should be reformed or abolished. On February 1, 2013, the Harper government sought clarification from the Supreme Court of Canada on the federal government's legislative power to reform or abolish the Senate. On April 25, 2014 the court ruled that this could not be done through federal legislation, but rather required constitutional amendment. To reform the Senate, the consent of at least seven provinces, which collectively have half of Canada's population, is required. Abolishment requires the consent of all ten provinces. The provinces' premiers, however, do not consider either a high priority. The Quebec Court of Appeal has re-iterated the role of the provinces in any decision. A June 2013 poll revealed that in the wake of the controversy, 49% of Canadians wanted to reform the Senate, 41% wanted to see it abolished, 6% wanted to keep it as it was, and 4% were unsure. On May 12, 2013, the Royal Canadian Mounted Police announced they were reviewing the expense claims. The RCMP had started their investigation in March 2013 when media reports were published regarding Deloitte's external review of the expenses of Brazeau, Duffy and Harb. On August 14, 2013, it was announced that the Auditor General of Canada would be reviewing the expense claims of all senators. In June 2015, the report was released by Auditor General Michael Ferguson. The Auditor General recommended that the cases of nine senators, including incumbent senators Pierre-Hughes Boisvenue and Colin Kenny, be referred for RCMP investigation, while 21 other senators were flagged for filling inappropriate expense claims including Senate Speaker Leo Housakos, Senate Government Leader Claude Carignan and Opposition Leader James Cowan. The Report indicated that nearly $1 million worth of inappropriate expenses were filed by the 30 senators. The senators identified in the Auditor General's report had the option to submit to binding arbitration by former Supreme Court of Canada Justice Binnie. Fourteen of the 30 senators opted for arbitration, and the arbitrator's report was issued on March 21, 2016. Of the total amount referred to arbitration, Binnie ruled that about 55% was owing to the Senate. In his report, he said that "I impute no bad motives to any of the senators." The Senate's investigation into the accuracy of Brazeau's declaration that his primary residence was in Maniwaki, Quebec began as a result of media reports. On November 20, 2012, a CTV reporter interviewed residents of Maniwaki, who said that Brazeau did not live there. The next day, the Senate Government Leader announced that a subcommittee would investigate whether Brazeau was in compliance with Senate rules. The review period was April 2011 when Brazeau began to claim living expenses to September 30, 2012, the last date for which full records were available. The subcommittee's investigation "raised a number of questions", and so on December 11, 2012, it met with Brazeau and his lawyer. After this meeting, Deloitte was retained for external review. Based on the finding that only 10% of Brazeau's time was in Maniwaki, the Senate ruled that his "level of presence" did not support his primary residence declaration. Brazeau was ordered to repay a total of $48,745. On July 3, 2013, the Senate announced it would reduce Brazeau's salary by 20% to obtain repayment. It would have taken about 21 months to recoup all that was owing; however, this was interrupted by the suspension without pay in November 2013. With the parliamentary session ending when the federal election was called, it is expected that Brazeau will begin receiving his salary again, so further amounts may be recovered through the 20% reduction. Brazeau was expelled from the Conservative caucus on February 7, 2013 over sexual assault allegations. On February 4, 2014 the RCMP announced that Brazeau was charged in relation to his living expenses with one count of fraud under s. 380 of the Criminal Code and one of breach of trust by a public officer under s. 122. The trial will be scheduled for 2017. Due to media reports regarding Harb's living expenses, the Senate began its investigation on December 6, 2012. The period of review was April 2011 to September 30, 2012 in keeping with the concurrent review of Brazeau's expenses which had been underway since November 22, 2012. The Senate chose not to conduct an internal review of Harb's expenses due to "experience in conducting one claims review internally", and so Deloitte was retained on January 3, 2013. Based on the finding that only 21% of Harb's time was spent at Westmeath, his "level of presence" did not support his primary residence declaration, and the Senate ordered that he repay expenses from April 2011 to date of $51,482, and that an internal investigation take place for the period prior to April 2011. Harb repaid this amount under protest and commenced action for judicial review of the Senate order. On August 26, 2013, he announced that he had repaid a further amount of $180,166 and was dropping the judicial review application. The total repaid inclusive of interest was $231,649 for living expenses dating back to 2005. Along with the announcement of repayment back to 2005, Harb announced his retirement from the Senate. Because he had been an MP for Ottawa for 15 years prior to his Senate appointment, he was eligible for a fully indexed parliamentary pension of $122,989 per year. On February 4, 2014, the RCMP announced that Harb was charged in relation to his living expenses with one count of fraud under s. 380 of the Criminal Code and one count of breach of trust by a public officer under s. 122. Harb was scheduled go to court on August 10, 2015 His trial was postponed into 2016 because the Duffy trial was taking longer than expected. A month after Duffy was found not guilty, the charges against Harb were dropped because the Crown did not see a reasonable prospect of conviction. Senate Administration was asked to provide a report of Duffy's travel patterns between PEI and Ottawa. Because this travel summary "raised concerns", on February 14, 2013, the Senate expanded Deloitte's review of expense claims to include Duffy's living expenses. The source of the $90,172 was by personal cheque from Nigel Wright who was then Chief of Staff in the PMO. The payment was made by bank draft to Duffy's lawyer dated March 25, 2013.:12–13 This did not become public until a media report of May 14, 2013. On May 15, 2013, the Prime Minister's Office confirmed that Wright had provided Duffy with a personal cheque. The federal Ethics Commissioner announced that he would review the case. The next day, Duffy resigned from the Conservative caucus; he now sits as an independent senator. On May 19, 2013, Wright announced that he had resigned from the PMO. :9 On May 22, 2013, Harper denied knowledge of the cheque. Harper's legal adviser also denied knowledge of the cheque. On May 29, 2013 the Senate amended its May 9 report on Duffy's expenses, noting that Duffy's "continued presence at his Ottawa residence over the years" did not support his declaration of Cavendish, PEI as his primary residence. The Senate would refer the matter to the authorities. According to unnamed sources, in February 2013 the Prime Minister's legal advisor, Benjamin Perrin, drafted a letter of understanding between Nigel Wright, the Prime Minister's Chief of Staff, and Duffy. The sources suggest that the letter stated Wright's intention to transfer $90,172 to cover Duffy's invalid expense claims. Perrin claims that the story is false. On July 30, 2014, the Law Society of British Columbia announced that it closed its file related to Perrin's alleged role in the affair because the complaint was not valid. On October 25, 2014, the Law Society of Upper Canada also reported that after fully investigating, it had no concerns whatsoever with Perrin's conduct as a lawyer. On June 5, 2013 Harper said in Parliament that: "it was Mr. Wright who made the decision to take his personal funds and give those to Mr. Duffy so that Mr. Duffy could reimburse the taxpayers. Those were his decisions. They were not communicated to me or to members of my office." On October 21, 2013, Duffy's lawyer claimed that the Prime Minister's Office "pushed" Duffy into accepting the cheque, contrary to the Prime Minister's statements that no one in his office other than Wright knew of the deal. The next day, Duffy told the Senate that Harper personally told Duffy to repay the money, quoting him as saying, "It's not about what you did. It's about the perception of what you did that's been created in the media. The rules are inexplicable to our base." On October 28, 2013, Harper stated in an interview that Wright had been "dismissed," contradicting his previous statements, made in the spring, that Wright had made his own decision to resign. Also on October 28, Duffy announced that the Conservative Party – via their chief lawyer, Arthur Hamilton – paid all of his legal fees relating to the scandal, tabling a cheque stub and corresponding memo as proof. Duffy also tabled documents supporting the legality of his residency claims. Duffy also tabled an email sent to him from Nigel Wright's account at the Prime Minister's Office; the PMO had previously claimed that none existed in response to an Access to Information Act request. On June 6, 2013, the Royal Canadian Mounted Police (RCMP) filed documents with the courts, revealing that three senior members of the Prime Minister's Office and another Conservative senator, Irving Gerstein, knew about the transfer of Wright's funds. According to the documents, the Conservative Party of Canada initially intended to pay $30,000 for Duffy to repay his expenses before they learned the full amount, and that Duffy was being investigated over three separate allegations of fraud. On June 13, 2013 the RCMP confirmed they were beginning an Official investigation into Nigel Wright. On June 24, 2013 the lead investigator Cpl. Greg Horton put to the courts an affidavit reporting a June 19 meeting with Nigel Wright's lawyers. Later one of the lawyers told the RCMP that Wright remembers that he told his executive assistant David van Hemmen, Harper's legal adviser Benjamin Perrin, and PMO Director of Issues Management Chris Woodcock about his intention to give Duffy the money. On July 17, 2014, the RCMP announced that it had laid 31 criminal charges against Duffy, including fraud under s. 380 of the Criminal Code, breach of trust by a public officer under s. 122, bribery of a judicial officer under s. 119(1)(a), and frauds on the government under s. 121(1)(c). Two charges related to the living expense claims, 18 to claiming expenses unrelated to Senate business, 8 to awarding of consulting contracts, and 3 to Wright's payment of $90,000. Duffy's trial began on April 7, 2015 at the Ontario Court of Justice in Ottawa. He pleaded not guilty to all 31 charges. Charles Vaillancourt, who was the presiding judge in the case, found Duffy not guilty on all 31 charges. The Crown decided not to appeal, saying that Crown's right of appeal is limited to errors of law. Wallin's travel expense claims came under investigation in November 2012 because she had an "unusual travel pattern". When travelling between her declared primary residence in Saskatchewan and Ottawa, Wallin often stopped over in Toronto, and was claiming the Toronto leg as part of her expenses. A senator may claim travel expenses only if parliamentary business is being conducted at the travel destination. Preliminary findings indicated "a pattern of claiming Senate expenses on personal or other business unrelated to the Senate, including boards she sits on." Wallin earned approximately $1 million in stock options and fees while on corporate boards since her appointment as senator. A Postmedia News analysis indicated Wallin was ranked second highest in overall spending at $369,593 behind recently retired Conservative Senator Gerry St. Germain, who spent $378,292 during the same period. Wallin reimbursed the Senate $38,369 following her own review, and an additional $114,538 inclusive of interest in September 2013. "Why is the Senate acting as accuser, judge, jury, and executioner before I have had a day in court? That's exactly why this whole process [is] flawed. If this chamber can take this extreme action with regard to a sitting senator, imagine what it can do to an ordinary citizen who crosses the government of the day. ... The issue is no longer about expenses, or audits, or transparency, or accountability, or even the reputation of this chamber — it's about an abuse of power. ... They were targeted leaks, many of them incorrect, designed to cast my conduct in the worst possible light. They were personal and vindictive, and they violated the rules of this place. ... The government [put] the sentencing before the trial..."
In May 2013 Wallin resigned from the Senate Conservative caucus pending the results of the external audit of her expense. The results of the Deloitte audit were referred to the RCMP for criminal investigation. By March 2015, the RCMP had identified 150 "suspicious" claims, with 21 of these involving her role on boards of Bell Media and BMO Harris Private Banking, and as chancellor for the University of Guelph. In August 2015 the RCMP referred its file to Crown prosecutors for decision whether criminal charges would be laid. A month after Duffy was found not guilty, the RCMP announced that it was no longer pursuing charges against Wallin. After 2 weeks of debate, on Tuesday November 5, 2013 the Senate voted to suspend Mike Duffy, Pamela Wallin and Patrick Brazeau without pay and most benefits. The Senators kept their health and dental benefits as well as their life insurance. The Senators were expected to be automatically and fully reinstated with the dissolution of Parliament prior to the 42nd Canadian general election, but due to pending charges against Duffy and Brazeau, certain Senate resources remain unavailable to them. Following Duffy's acquittal on all charges, he returned to the Senate in full standing. Each province or territory is allocated a set number of Senate seats, so that Canada's regions have a voice in the legislative process, even if their population is comparatively small. Senators must own property in the region for which they are appointed, and they "shall be resident" in that region. There is no definition of "resident". Deloitte LLP was the audit firm hired by the Senate to investigate the expense claims of Brazeau, Duffy, Harb, and Wallin. The review periods of the Deloitte audits were: April 1, 2011 to September 30, 2012 for Brazeau, Duffy, and Harb, and for Wallin the review period was January 1, 2009 to September 30, 2012. On February 28, 2013, the committee reported that it was satisfied with the documentation provided and no further senators were to be referred for external review. The Senator's Travel Policy was reviewed to "comply with primary residence declarations" and a report was made on May 9, 2013. Among the recommendations was that the following be deleted from the Senate Rules: "Senators act on their personal honour and Senators are presumed to have acted honourably in carrying out their administrative functions unless and until the Senate or the Internal Economy Committee determines otherwise." The definitions of National Capital accommodation and provincial residence were changed, but no reference was made to changing the definition of primary residence. The Senate referred all 30 cases to the RCMP. As at March 16, 2016, the RCMP found no evidence to warrant criminal charges against 24 of the 30 senators, including Pierre-Hughes Boisvenu, Sharon Carstairs, William Rompkey and Rod Zimmer. The RCMP is still investigating six senators, including Marie-P. Charette-Poulin, Colin Kenny, Rose-Marie Losier-Cool, Donald Oliver and Gerry St. Germain. A dispute resolution process through binding arbitration was established for senators who disagreed with the Auditor General's findings. Ian Binnie, retired Supreme Court of Canada Justice, led the arbitration. "There was such a pervasive lack of evidence, or significant contradictory evidence, that we were prevented from reaching an audit opinion about whether the expenses had been incurred for parliamentary business." "we determined the expenses were not in accordance with the applicable Senate rules, policies, or guidelines." In the News Release accompanying the March 21, 2016 release of former Justice Binnie's arbitration report, the Senate said that the report would assist in its efforts to "bring clarity" to Senate expense claim rules. As part of its modernization, the Senate has "made several significant changes including tightening expense provisions for travel, hospitality and procurement; requiring proof of residency; implementing a new Ethics and Conflict of Interest Code that ranks among the toughest in the Commonwealth; and the establishment of an independent Office of the Senate Ethics Officer." The Senate will also introduce "a more detailed model of proactive disclosure and more independent oversight measures." ↑ Laura Payton. "Senate scandal puts Harper's brand at risk, poll suggests". CBC News. 01 November 2013. ↑ Report of the Auditor General of Canada to the Senate of Canada—Senators' Expenses, (http://www.oag-bvg.gc.ca/internet/docs/parl_otp_201506_e_40494.pdf). June 4, 2015. 1 2 3 4 5 6 7 8 The Standing Committee on Internal Economy, Budgets and Administration, 23rd Report (http://www.parl.ca/Content/SEN/Committee/411/ciba/rep/rep23may13-e.htm) May 9, 2013. Retrieved August 25, 2015. 1 2 3 4 5 The Standing Committee on Internal Economy, Budgets and Administration, 27th Report (http://www.parl.ca/Content/SEN/Committee/411/ciba/rep/rep27aug13-e.htm) August 13, 2013. Retrieved August 25, 2015. 1 2 3 4 5 6 The Standing Committee on Internal Economy, Budgets and Administration, 24th Report (http://www.parl.ca/Content/SEN/Committee/411/ciba/rep/rep24may13-e.htm) May 9, 2013. Retrieved August 25, 2015. 1 2 3 4 The Standing Committee on Internal Economy, Budgets and Administration, 22nd Report (http://www.parl.ca/Content/SEN/Committee/411/ciba/rep/rep22may13-e.htm) May 9, 2013. Retrieved August 25, 2015. 1 2 3 4 Global News, and The Canadian Press. "Timeline: Key Dates in the Evolution of the Senate Expense-claim Controversy." Global News, 18 June 2013. Web. 27 July 2013. ↑ Cheadle, Bruce. "Duffy says he's repaid housing expenses" Global News, 19 April 2013. Web. 27 July 2013. ↑ Fife, Robert, and Phillip Ling. "RCMP Allege Senator Mac Harb Claimed Expenses on 'uninhabitable' Home." CTVNews. CTV News, 25 July 2013. Web. 27 July 2013. ↑ Ditchburn, Jennifer. "Tory-dominated Senate Committee Deleted Tough Parts of Mike Duffy Expense Report: document." The National Post. The National Post, 23 May 2013. Web. 27 July 2013. ↑ Press, Jordan. "Senate Committee Accused of Whitewashing Initial Report Decides to Reopen Mike Duffy's Expense audit." The National Post. National Post, 22 May 2013. Web. 27 July 2013. ↑ Radia, Andy. "Mike Duffy May Now Be Investigated for Double-dipping amid Growing Anti-Senate Sentiment." Yahoo! News Canada. Yahoo, 17 May 2013. Web. 27 July 2013. 1 2 The Standing Committee on Internal Economy, Budgets and Administration, 26th Report (http://www.parl.ca/Content/SEN/Committee/411/ciba/rep/rep26may13-e.htm) May 29, 2013. Retrieved August 25, 2015. ↑ Payton, Laura. "Tories to Refer Senate Reform Questions to Supreme Court." CBCnews. CBC/Radio Canada, 01 February 2013. Web. 27 July 2013. ↑ Benzie, Robert. "Senate Scandals Should Not Influence Reform, Premiers Say." Thestar.com. The Star, 26 July 2013. Web. 27 July 2013. ↑ "Court gives thumbs down to Harper government's Senate reform plan". Archived from the original on January 5, 2014. Retrieved February 4, 2016. ↑ CBC News. "Majority Wants Senate Changed or Abolished, Poll Suggests." CBCnews. CBC/Radio Canada, 20 June 2013. Web. 27 July 2013. ↑ "Auditor general to review all senators' expenses". Canadian Broadcasting Corporation. 15 August 2013. Retrieved 16 August 2013. ↑ "3 top senators wrongly billed expenses, auditor's report says". Ottawa Citizen. 4 June 2015. Retrieved 6 June 2015. 1 2 3 "Senators Repayment Status" (http://sen.parl.gc.ca/portal/reporting/AG/index-e.htm) May 31, 2016. Retrieved June 4, 2016. ↑ CTVNews.ca Staff, "Senator who lives near Ottawa gets $20K housing allowance" (http://www.ctvnews.ca/politics/senator-who-lives-near-ottawa-gets-20k-housing-allowance-1.1046956) November 20, 2012. Retrieved August 26, 2015. ↑ CTVNews.ca Staff, "Senate committee looking into Brazeau's housing allowance" (http://www.ctvnews.ca/politics/senate-committee-looking-into-brazeau-s housing-allowance-1.1048276) November 21, 2012. Retrieved August 26, 2015. ↑ Smith, Joanna. "Senate Expenses Scandal: Patrick Brazeau's Wages to Be Clawed Back." Thestar.com. The Star, 03 July 2013. Web. 27 July 2013. ↑ Woods, Michael. "'Weathering the Storm,' Sen. Patrick Brazeau to 'vigorously' contest sexual Assault charges." National Post. The National Post, 22 March 2013. Web. 27 July 2013. ↑ Senate News Release, "Payment received from Senator Harb for living and related expenses reimbursement" (http://www.parl.gc.ca/Content/SEN/Committee/411/ciba/press/26aug13-e.htm) August 26, 2013. Retrieved July 24, 2015. ↑ Michelle, Zilio (4 January 2015). "From court battles to an election, what to expect in Canadian politics in 2015". CTVNews.ca. Bell Media Television. Retrieved 5 April 2015. ↑ CTV News Staff, "Mike Duffy made secret deal with Harper's chief of staff during audit" (http://www.ctvnews.ca/politics/mike-duffy-made-secret-deal-with-harper-s-chief-of-staff-during-audit-1.1282015) CTV News. May 14, 2013. Retrieved September 2, 2015. ↑ Stone, Laura. "Ethics Commissioner Reviewing Mike Duffy Affair." Global News. Global News, 15 May 2013. Web. 27 July 2013. ↑ "Five questions about rediscovery of Senate emails" The StarPhoenix May 22, 2013. ↑ Janus, Andrea. "PM's Former Legal Adviser Arranged Deal for Wright to Give Duffy $90K." CTVNews. CTV News, 20 May 2013. Web. 27 July 2013. ↑ Wherry, Aaron. "Benjamin Perrin: 'I was not consulted on, and did not participate in, Nigel Wright's decision'" Macleans. Web. ↑ "B.C. law society won't investigate former PMO lawyer Benjamin Perrin". CTVNews.ca. Bell Media Television. 30 July 2014. Retrieved 5 April 2015. ↑ Mendleson, Rachel (25 Oct 2014). "Case closed on lawyers in Mike Duffy-Nigel Wright affair". thestar.com. Toronto Star Newspapers Ltd. Retrieved 5 April 2015. ↑ MacKreal, Kim. "Duffy's lawyer says Harper's office pushed Senator into scandal" The Globe and Mail, 21 October 2013. Web. 21 October 2013. ↑ "Mike Duffy claims Harper told him to repay expense money". CBCNews. CBC/Radio-Canada. 22 October 2013. Retrieved 8 April 2015. ↑ The Canadian Press. CityNews Toronto. 22 October 2013. Web. 22 October 2013. ↑ Cheadle, Bruce (28 October 2013). "Nigel Wright was 'dismissed,' Stephen Harper says — at odds with May statement that former chief of staff resigned". National Post. Postmedia Network Inc. Retrieved 5 April 2015. 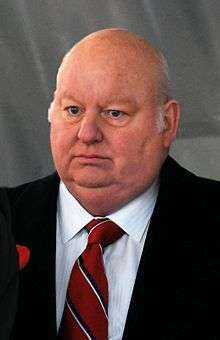 ↑ Gloria Galloway and Kim MacKrael. . "Conservatives gave Duffy more than one cheque, senator claims". 28 October 2013. ↑ The Globe and Mail. Read Duffy's documents, including e-mails and cheque for Conservative lawyer. 28 October 2013. ↑ Greg Weston. Senate scandal creates no paper trail in PM's own department. 26 August 2013. 1 2 MacKinnon, Leslie. "8 Things Revealed by RCMP's Court Filings on Mike Duffy." CBCnews. CBC/Radio Canada, 06 July 2013. Web. 27 July 2013. ↑ Stephen Chase, Daniel Leblanc. RCMP drop investigation into Nigel Wright over $90,000 Duffy cheque. 15 April 2014. ↑ Leblanc, Daniel, "PM's ex-chief of staff prepares to testify" (http://www.theglobeandmail.com/news/politics/nigel-wright-prepares-to-testify-at-duffy-trial/article25899786/) The Globe and Mail August 10, 2015. Retrieved August 12, 2015. ↑ Payton, Laura (7 April 2015). "Mike Duffy pleads not guilty as Senate expenses trial gets underway". CBCNews. CBC/Radio-Canada. Retrieved 7 April 2015. ↑ Stone, Laura (21 April 2016). "Duffy cleared of all charges as judge excoriates Harper's office". The Globe and Mail. Retrieved 21 April 2016. ↑ "Crown won't appeal Mike Duffy acquittal, spokesman says" (http://www.cbc.ca/news/politics/mike-duffy-court-no-appeal-1.3597437) CBC News. May 24, 2016. Retrieved June 5, 2016. ↑ Smith, Joanna (24 May 2013). "Senate asked Deloitte to broaden investigation into Sen. Pamela Wallin's travel expenses | Toronto Star". thestar.com. Retrieved June 1, 2013. ↑ Smith, Joanna (6 June 2013). "Pamela Wallin earned approximately $1 million as corporate director since Senate appointment | Toronto Star". thestar.com. Retrieved June 6, 2013. ↑ Press, Jordan. "Pamela Wallin, Mike Duffy among the top 10 spenders in the Senate | Canadian Politics | Canada | News | National Post". nationalpost.com. Retrieved March 8, 2013. ↑ Senate News Release, "Expenses reimbursement received from Senator Wallin" (http://www.parl.gc.ca/Content/SEN/Committee/411/ciba/press/13sep13-e.htm) September 13, 2013. Retrieved July 24, 2015. ↑ "Debates of the Senate (Hansard)". Parliament of Canada. Senate of Canada. 23 October 2013. Retrieved 5 April 2015. ↑ CBC News. "Senator Pamela Wallin leaves Conservative caucus – Politics – CBC News". cbc.ca. Retrieved May 17, 2013. ↑ "Pamela Wallin may be asked to pay more by Senate committee". Canadian Broadcasting Corporation. 15 August 2013. Retrieved 15 August 2013. ↑ "Pamela Wallin's 'troubling' expense audit headed to RCMP". Canadian Broadcasting Corporation. 13 August 2013. Retrieved 15 August 2013. ↑ MacKinnon, Leslie. "Senate votes to suspend Brazeau, Duffy, Wallin". CBC.ca. CBC. Retrieved 30 November 2013. ↑ Barton, Rosemary. "Suspended senators will be back on the public payroll during election". CBC.ca. CBC. Retrieved 14 August 2015. ↑ Geddes, John. "Catching up on the Senate status of Duffy, Brazeau and Wallin". Macleans.ca. Macleans. Retrieved 15 August 2015. ↑ Reference re Senate Reform  1 S.C.R. 704, para 15. 1 2 3 4 5 6 7 8 9 10 11 12 13 14 15 16 17 18 19 20 21 22 23 24 25 Report of the Auditor General of Canada to the Senate of Canada—Senators' Expenses, (http://www.oag-bvg.gc.ca/internet/docs/parl_otp_201506_e_40494.pdf). June 4, 2015. ↑ The Standing Committee on Internal Economy, Budgets and Administration, 19th Report (http://www.parl.ca/Content/SEN/Committee/411/ciba/rep/rep19feb13-e.htm) February 28, 2013. Retrieved August 25, 2015. ↑ The Standing Committee on Internal Economy, Budgets and Administration, 25th Report (http://www.parl.ca/Content/SEN/Committee/411/ciba/rep/rep25may13-e.htm) May 9, 2013. Retrieved August 25, 2015. ↑ Senate News Release, "Senate Speaker releases full report of Auditor General of Canada" (http://sen.parl.gc.ca/portal/reporting/AG/index-e.htm) June 9, 2015. Retrieved July 28, 2015.